Don Tapscott's Macrowikinomics (co-written with Anthony Williams) highlighted the groundbreaking step taken in 2007 by Novartis of sharing its type 2 diabetes research online. GC catches up with Felix R. Ehrat, Novartis Group General Counsel, to find out more about the practicalities of open collaboration. In association with MLegal, GC gathered a number of leading in-house counsel in Houston to consider where the role of the general counsel is heading, along with that of their legal team. MasterCard’s Tim Murphy discusses his return to legal after ten years in business roles. GC looks at big data analytics and what it means for in-house teams and their businesses. With the economic miracle behind them, Turkish businesses now face more challenging times. But there are also opportunities to be seized, according to honourees of The Legal 500’s GC Powerlist: Turkey. Leaders at Wyndham Worldwide talk us through its investment in leadership and development, and the company’s use of personality profiling to identify and support talent across the business. If you’ve been catapulted from the safety of a legal silo into the realm of department management, you’ll know that managing an in-house legal team can be a huge learning curve. But what if your department (and your remit) suddenly get a lot bigger? in-house departments promote race and ethnic diversity? Microsoft deputy general counsel (and first female lawyer) Mary Snapp and Covington & Burling’s London head of technology; Lisa Peets, discuss the diversity work that their organisations are doing, both separately and together. 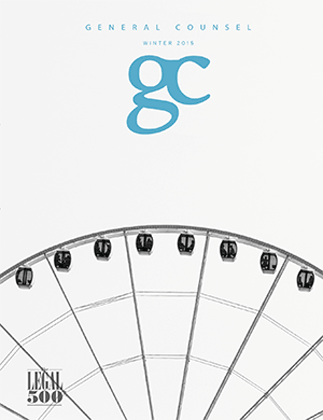 GC and The Legal 500 work together on a series of specially-commissioned reports about diversity and inclusion in businesses worldwide. Can in-house lawyers effectively manage enterprise risk? GC investigates. GC discusses economic and legal trends across the region with some of the leading in-house counsel profiled in The Legal 500’s GC Powerlist: Nordics. GC talks to in-house leaders about coping with a far-flung legal team. Keith Ruddock retired at the end of 2015 after an in-house career that spanned over 23 years – first at Shell, and then at global engineering company The Weir Group. GC collects his reflections for success in the in-house role. In November 2015, GC, in association with Finnegan, gathered together IP counsel and GCs In London to discuss emerging trends and strategies in the changing world of intellectual property.